Sherwood Gardens is a 6-acre (24,000 m2) park located in the Guilford neighborhood of Northern Baltimore, Maryland. The gardens are bordered by East Highfield, Underwood, Stratford and Greenway Roads. In addition to well-groomed, standard ground cover (Azaleas, evergreens, etc...), Sherwood Gardens is famous for its nearly 80,000 tulips that peak in late April. After the tulips finish blooming, residents can dig up and purchase tulip bulbs. The park is currently maintained by the Guilford Association. During the 1800s the property on which the Sherwood Gardens rest was part of the Guilford estate of A. S. Abell, founder of The Baltimore Sun. The location of the gardens was a pond, which was filled in when the area was developed for housing in 1912. 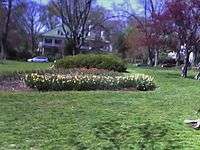 John W. Sherwood, a son of the president of the Baltimore Steam Packet Company (the "Old Bay Line") and one-time chairman of the Sinclair Oil Company, began planting the gardens in the 1920s near his home. He allowed the public to visit the gardens during the month of May. Sherwood planted his gardens with tulips imported from the Netherlands. Following his death in 1965, Sherwood Gardens was acquired by the Guilford Association, which then expanded them. The gardens are now open to the public year-round. 1 2 3 Rasmussen, Frederick (2008-04-20). "Who was the man behind those tulips?". The Baltimore Sun. pp. 24A. Archived from the original on May 17, 2008. Retrieved 2008-04-20.